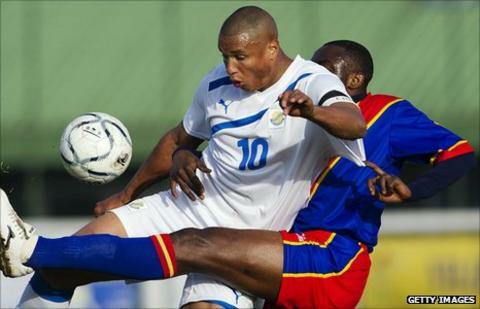 Gabon striker Daniel Cousin has returned home to play for FC Sapins to boost his chance of playing at the 2012 Africa Cup of Nations. Cousin has been without a club since leaving Greek side Larissa in June. Coach Gernot Rohr has warned that players who are inactive will not be selected for next year's tournament. With just over three months to Gabon's co-hosting of Africa's flagship competition, Cousin has reached a deal to keep him in shape. "It's done. Daniel Cousin should start with us by next week," Bruno Batchy Nzinga, general secretary of FC Sapins said. "It's no secret that the manager of the national team said he has to play matches to be selected." The deal with FC Sapins allows the striker to leave without any conditions if he gets an offer from a club in Europe. Cousin is one of Gabon's key players and he is expected to play a major role for the Panthers when they host the Africa Cup of Nations. The 34-year-old played for French sides Le Mans and Lens in the early 2000s before clinching a move to Scottish club Rangers. He also had a stint with Hull City in the English Premier League before moving to Larissa two seasons ago.